The (arguably) most popular Star Trek captain has agreed to reprise his role in a new upcoming Star Trek series. CBS has just announced that Patrick Stuart will be returning as Captain Jean-Luc Picard in a new show on CBS All Access. Patrick Stuart himself made the announcement during a live panel at Star Trek Las Vegas, an annual convention held in Sin City. It was a surprise appearance and the crowd erupted when Sir Patrick Stuart came out and the new show was revealed. 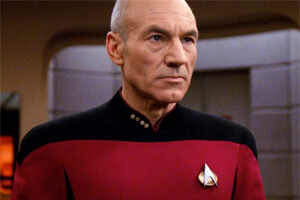 Even the most diehard fans never imaged they would see Captain Picard on TV or the silver screen again. The show will take place 20 years after the events of Star Trek: Nemesis. That film was released on December 9, 2002, so the timeline and aging of the British actor should all mesh well together. Producers behind the new show say no scripts have yet been written. No premiere date has been set. When things ended with Star Trek: Nemesis back in 2002, Picard was saying goodbye to the crew of the Enterprise E. Picard had a new first officer, as William Riker and Deanna Troi (the two now being married), were heading off to a new assignment on the U.S.S. Titan. Data had just died saving the Enterprise. The idea and concept of a new show is very intriguing. It will have an instant fan base and following. It will also probably drive new subscriptions for CBS All Access.